If you have noticed a dark, bruised looking spot or brown streak under your toenail, keep an eye on it as it is possibly a melanoma. 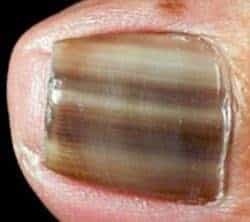 These toenail melanomas are the same type that is found on any part of your skin, but they have grown underneath your nail. 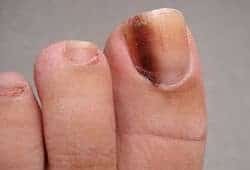 If you have spent many years wearing nail polish, or not taking too much notice of your toes, it is possible that you have missed such a symptom completely. Because you don’t always just sit, looking at your toenails all the time, the problem is caught later than it should be, which can increase any problems. Skin that is darker or is darkening next to the nail. A nail that bleeds for no reason or develops a “bump” or raised area. Cracking or splitting nails (can also be related to nail fungus). If you have a nail that comes away from the “nail bed” without any physical trauma or injury to that nail or toe. Purple, brown or black spots, marks, streaks, lines or patches know as Melanonychia. Any type of marking that increases in size. A mark that looks like a bruise, but does not move with the nail as it grows or changes shape over time. If you have a mark that looks like a bruise, but you have no idea how it got there. Read more information at Medial News Today’s article on Subungal melanoma symptoms. The most common symptom of this sort of cancer is when a small, dark spot can be seen under the toenail. You may mistake this for a normal mole as they look very similar. They can be either brown, dark brown, black or even yellow, resembling a bruise. One common symptom is where you have a dark line that stretches from the tip of the nail to the cuticle. This is also known as a “Hutchinson’s sign“. In a rare number of cases, the melanoma spot has not unusual color at all, making it hard to see. Unfortunately, these are often not detected soon enough and can be dangerous if they are malignant growths. Research and medical studies have revealed that this sort of melanoma is more common in Asian and darker-skinned people, but it is also possible for Caucasians to be affected by this type of cancer too. Most melanomas are related to skin cancer and therefore they can be attributed to spending too much time in the sun, or not using sun creams properly, or even at all. But, a toenail melanoma is not caused in this way – in fact, there are no conclusive explanations as to why they may occur. Some doctors think they might be caused by damage to the toe or nail. There is no such thing as a skin cancer that affects the toenail directly. If you had skin cancer on the toe or foot, it might cause some damage to the nail bed or matrix, but you cannot get skin cancer on the nail itself. Initially, the doctor may use the “ACBDEF method” to help identify if the marks you have are cancerous. A – The age of the patient is taken into consideration because if you are over 50, the risk of getting this is higher. B – Are there any bands and what color are they: Black or brown and are the borders of the bands blurred? C – Has the mark changed at all since it was noticed? Getting bigger or darker can be a symptom. D – Which digit is the mark affecting? It is mainly your big toe that is affected. E – Has the coloration made any extension to the surrounding area? F – Have your family had any history of cancer or specifically this type? If anything is suspected, a proper diagnosis is done by taking a small biopsy of the tissue from under the nail. This is done by punching or drilling through the nail and taking a sample from an affected area. It is done under local anaesthetic and does not take long to perform. The sample is then examined by a Dermatopathologist who will be able to make an informed diagnosis. This is not something you can diagnose yourself, so please see a doctor as soon as possible if you think you may have this problem. Getting early medical advice or intervention is very important. You might think that it is just a brown spot under your toenail, but it does mean that you need to seek some help. Unfortunately, research shows that treatment or removal of most toenail melanomas is done whilst they are in a later stage of growth. These are technically tumors but are often benign, meaning that they can be removed quite quickly and easily with surgery. Important note: They are usually done later because they are identified late – which again prompts me to remind you to make an appointment if you think you have something like this. However, one thing to note is that because it is covered by a nail, the toe or thumbnail will most likely be partially or completely removed to allow access to the affected area. The surgery should only last for around an hour and it will be completed under local aesthetic, meaning a lengthy stay in hospital is not likely unless there are complications from the surgery. If there is cancer, your doctor may follow up with chemotherapy or radiotherapy. It is also possible that a small part of your toe will be removed if there is cancer and it has spread. However, if the diagnosis is very late and the cancer has spread to other parts of your body, the treatment will become more general as specifically targeting your toe will not help as much as having proper cancer treatments. the 5 year survival rate from a toenail melanoma is 16% to 87%. As with any cancer, the earlier it is detected, the more effective the treatment will be. However, because of the location and the way this cancer looks, there is usually a delay in being diagnosed and treated, which can lead to lower survival rates. Is a toenail melanoma rare? Toenail melanomas affect 1 in 120 men and 1 in 95 women. Other statistics show that it only accounts for 0.7% and 3.5% of all melanoma cases. Some research published in 2010 revealed that in the UK, there were over 8500 new cases treated per year. There is a 60% chance that they will occur in the fingernails, compared to 40% in the toes. Your thumbs and big-toes are the most common digits to be affected. They are also more common in older people, between the ages of 50 to 70 years old. Does it cause your toes to hurt? If the melanoma is newer, there could be no pain at all, unless your nail becomes damaged. 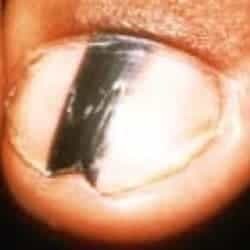 If the nail lifts from underneath, the toe and nail will become sore and will cause you some pain. However, if the problem has not been spotted early, the cancerous cells can spread to the bones of your toes and this can cause quite a lot of pain. What is a subungal melanoma? The term “subungal” just means “under the nail” and is often used to describe a mark or problem that appears below the nail surface. Subungal – the issue is found in the nail bed or matrix and is under the nail. 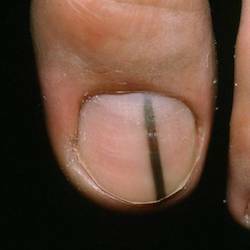 Ungual – the melanoma grows from underneath the nail “plate”. Periungual – where the melanoma is found on the skin surrounding the edges of the toenail. What does a toenail melanoma look like? I have compiled a small collection of toenail melanoma images, hoping that they will either put your mind at rest or make you take action and see a doctor. 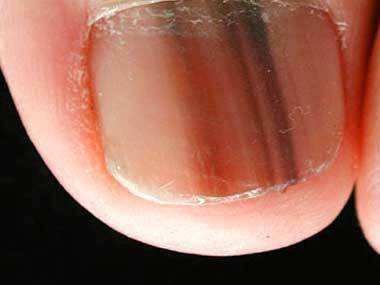 This is a good example of a dark brown streak found on the big toe. To me, this looks like a bruise or the result of some damage to the toe or nail, but it is a melanoma. Multiple brown lines or streaks are common in this type of cancer. Having a small dark spot under the thumbnail like this needs to be checked out by a doctor as soon as possible. This big toe is showing signs of a melanoma. You might think that it would be impossible to miss lines like these on your nails, but people either ignore or miss them regularly. 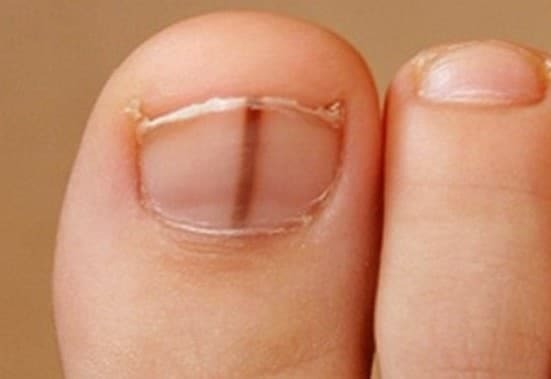 This is a very dark line on the toenail which is a sign of a melanoma. Again, this looks a lot like the person has damaged their toe by kicking something. However, if the bruise does not go away it needs to be checked. Don’t let the crack in the front of the nail fool you into thinking that it was caused by damage. This very dark line is a tell-tale sign of a toe melanoma. Could it just be a bruise? 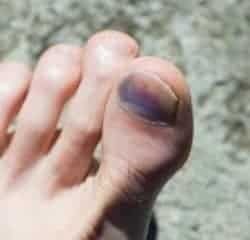 Just for some reference, here are some images of bruises of the toe and toenail for you to compare. The marking on this toenail is a bruise. Note the mark goes across the nail and you can see some bruising on the skin too. This bruised toenail has a white mark where the damage was caused and the mark looks like blood. Where there is a marking at the base of the nail like in this image, this is usually caused by impact damage; kicking something for example. 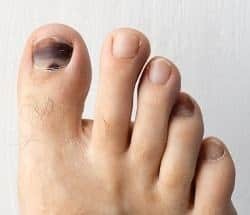 Toenail fungus is a more common problem that you might experience, however, it is more easily identified compared to a melanoma. 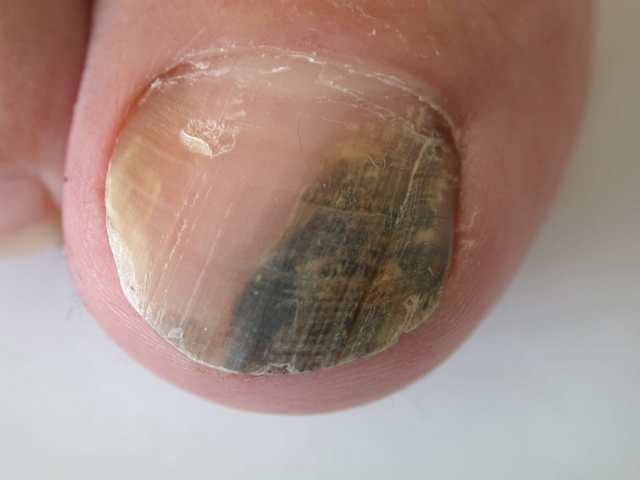 Toenails that are infected usually become thicker, change size or shape, become lighter in color (yellow and brown) and have scaly, brittle edges. They can have dark brown areas, but the infection usually affects more than one toe at the same time. If the fungus does appear under the toenail, it is more likely to be a white patch that grows. 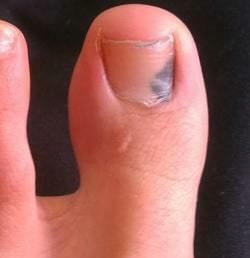 As the fungus spreads underneath, the toenail will most likely split and may fall off. What about white streaks on your nails? Another possible symptom to be aware of is noticing a white streak on your nails. Some people do have white marks on their nails, but this is usually due to some sort of damage that you may have done to it. It is also more probable that any white marks or ridges on your nails are due to vitamin deficiency. However, if you notice these white streaks, where you are certain you have not caused them through any other means, it is important to seek advice from your doctor as soon as possible. It could also be a sign of toenail fungus or an infection. 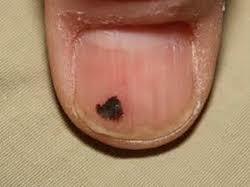 It is also possible for nail melanomas to form on any nail – not just the big toenail, but on your fingernails too. However, these do not appear as often on the fingernails as they do on the toes – but taking care to look after your nails and note any changes to them is important too. If you suspect that you have a nail melanoma, the first advice is not to panic. The possibility that the mole or mark is cancerous is quite low and the sooner you take action to investigate it, the better. Start by making a note of the location and size of the spot – taking photographs is a good way to do this. If, whilst you are monitoring it over a few days, you can see that the spot has grown in size or changed color, there is a higher chance that it could be a melanoma. The next step will be to make an appointment with your doctor and present your findings to them, asking for a referral to check if this spot is turning into a melanoma. It is likely that, in the absence of any other possible cause for the discoloration or mark, that you will be sent for a biopsy to confirm it’s status. If you notice any of these signs and symptoms, it is important that you make an appointment with a doctor as soon as possible. To put it bluntly, these melanomas are often non-cancerous (malignant) but they are cancer and are best investigated and treated as early as possible. Early detection will increase the recovery rate and will put your mind at rest more quickly. Because a toenail melanoma is a type of cancer, it is also highly likely that a follow-up course of chemotherapy and radiation treatment will be completed.